The Isle of Wight ferry is part of the charm of the island... crossing The Solent gives you a real sense of getting away from it all! There are three main companies which all depart from different mainland towns or cities. For a day trip or a holiday, the ferries, fast cats and hovercrafts take between 10 minutes and 1 hour. (Foot passenger ferries are faster than vehicle ferries.) 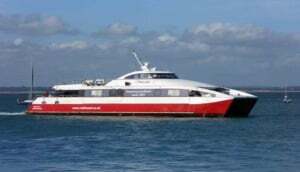 Travel from Lymington to Yarmouth, Southampton to East Cowes or West Cowes, and Portsmouth or Southsea to Ryde or Fishbourne. Average crossing 30 minutes.